I first met Ayrton Senna on a cold wet day at the Nürburgring in May, 1984. Mercedes had invited me to drive in a celebrity race which included nine world champions, past, present and future. We drove matched Mercedes 190’s. But out there in the cold rain, the youthful Ayrton Senna ran away from us all and only Niki Lauda was able to mount any sort of challenge. That day I think we all realized we’d seen something rather special; and I certainly left Nürburg convinced that I’d seen a future world champion…and maybe a little more than that. History confirms that Ayrton Senna did indeed become a little more than that! I wasn’t close to Ayrton in the way that Gerhard berger was close, but we were friends and I liked him. We would exchange Christmas cards and our paths would cross; and when they did we’d talk the way friends do. Visitors to my home often ask me just how highly I rated him. I show them my hallway. Along the wall hang two large signed pictures of racing drivers. One is Juan Manuel Fangio. The other is Ayrton. ‘That is how high,’ I say. The word ‘genius’ is used rather carelessly these days; but a genius is undoubtedly what he was. 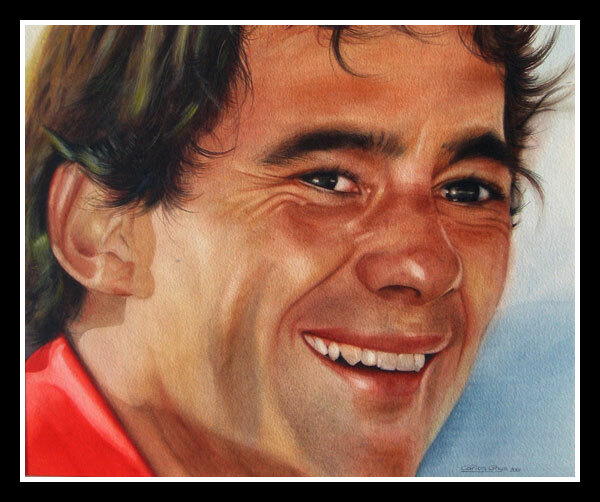 In the hands of a master such as Ayrton, the miraculous and the mundane can look deceptively similar. But I’ve seen him overtaking on the outside of a bend in heavy rain, and marvelled at a talent that was threatening to take car control across new horizons. As a pure racing driver, he was virtually without flaw. A man who didn’t have off days, who excelled on every type of circuit, in sunshine and in rain. He had an all-consuming passion for motor-racing, and for winning, that few men will ever know. It dominated his entire life and perhaps explains why the public were so slow to recognize his true worth both as a driver and a man. Many accepted the image of a man constantly at war with his rivals; and preferred to choose more peaceful, more equable heroes. And it was true. Ayrton could be difficult and he did occasionally do foolish things. But then men who care often do. However there were other qualities that few ever wrote about. He was totally loyal to his friends and to his family. He was honest to an unusual degree. And he could be touchingly kind, particularly to the younger drivers. When Rubens Barrichello regained consciousness after his crash at Imola, he found Ayrton seated beside the bed. And recounts Rubens in some wonder, ‘There were tears in his eyes’. Having known Ayrton, that doesn’t surprise me at all. To go ever faster, to constantly find new mountains to climb…this was an essential part of Ayrton’s nature. He knew he had been given a very special talent and he wanted the chance to display it to the world. He had always hoped that in the Williams he would be able to take the art of driving across new frontiers. It was then that fate dealt him the cruellest of hands. Imola may have denied him his dream. But nothing can change what has gone before or wash away the memories. Ayrton can sleep in peace. He had already climbed the highest mountain.